Taken at face value, this quiet film by Aparna Sen is a melancholy tale about a lonely woman facing her twilight years. It has a clear allegorical reading, however, that is a forceful commentary on the role of the British in post-Independence India. Violet Stoneham (Jennifer Kendal) is a mousy, quiet Anglo-Indian woman. Living in 1970s Calcutta, she teaches Shakespeare to inattentive little girls, occasionally visits her senile brother (Geoffrey Kendal) in a nearby nursing home, and returns home to her tiny flat and the company of her cat, Sir Toby. One day Violet encounters one of her former students, Nandita (Debashree Roy) and Nandita's boyfriend Samaresh (Dhritiman Chatterjee). Eager to reminisce - and starved for companionship - Violet invites the young couple to her home for tea, and they politely, if reluctantly, agree. In Violet's flat, Samaresh smells opportunity - the flat would offer a perfect, discreet hideaway for afternoon trysts with Nandita. 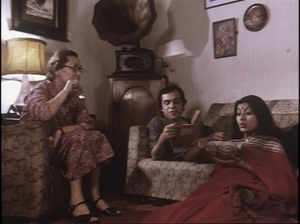 Nandita explains to Violet that while Samaresh is a writer, he finds it difficult to concentrate on poetry in his family's crowded home, and Violet is delighted to offer him the use of her flat. Nandita and Samaresh frolic there every day, taking care to be dressed and presentable when Violet returns from school. Often they serve Violet her tea or take her out for walks in the city, and their daily company cheers and energizes her. It seems a very genuine and tender friendship, but Samaresh and Nandita see it quite differently from Violet. At its face, 36 Chowringhee Lane is a very sympathetic tale. Violet Stoneham is a lovable character, and her loneliness will resonate with anyone who has ever thought about getting older and being alone. Her increasing isolation and marginalization is poignant. And the tenderness that Nandita and Samaresh show her - at least while it appears sincere - and the warmth and joy in her response to it is touching. But the film seethes with symbols suggesting that its real message is a strong critique of the Anglo presence in India: You are dated, you have outlived your usefulness; you aren't wanted or needed, so get lost. The young couple uses her while it's convenient, but as soon as they have the opportunity to take off on their own, they do so. The new principal at Violet's school - the school's first Indian principal, we are told - cuts back on her course load, assigning her a dreary grammar class while a new young teacher takes over the Shakespeare; even teaching quintessentially English subjects, Violet's English perspective is no longer needed. Violet's visits to her brother are particularly unsubtle; a relic of the colonial era, he is now weak, helpless and disoriented, and Violet must repeatedly explain to him that the Raj is over, that India is independent. These two levels of meaning make 36 Chowringhee Lane a full meal, engaging, poignant, and thought-provoking. The performances are smooth and natural - unlike some of Aparna Sen's later films (such as 15 Park Avenue and Mr. and Mrs. Iyer), in which her actors sometimes fumble stiffly with English dialogue. The result is a satisfying film, and if it is a little bit sad for the increasingly irrelevant Violet Stoneham, it also portrays a confidence in the rising of an independent India.